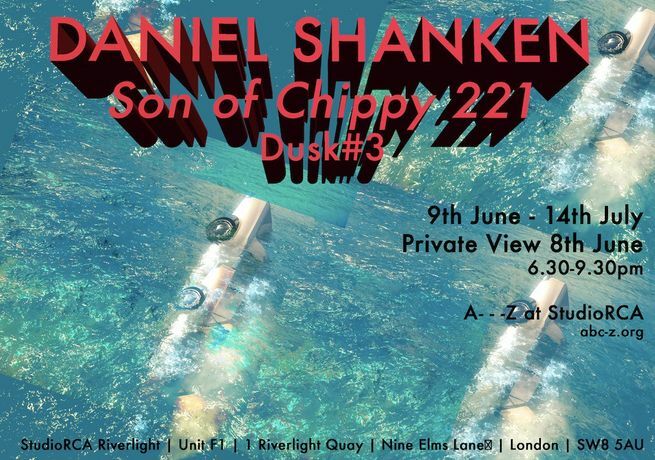 Daniel Shanken will present a new work titled Son of Chippy 221 specially commissioned by A- - -Z on view from 9 to 14 of July at StudioRCA Riverlight. Narrated by vlogger, Danial Tijuana Gringo, unscripted from his bedroom in the USA or Mexico, Son of Chippy 221 delves into the mind of a security guard reluctantly guarding a gallery below an apartment complex. Surrounded by imagery shot virtually and on location in Aldershot, it features Banger Racing and island demolitions. Daniel Shanken is an artist from Los Angeles, living and working in London. Currently, he is undertaking a PhD in the Contemporary Art Research Centre at Kingston University. Recently his work has been shown at Art Basel Hong Kong, Yvonne Lambert Gallery, Whitechapel Gallery, CCA Glasgow, Nottingham Contemporary, CFCCA Manchester, Kiasma Helsinki, CAC Vilnius, and CGP London. Last summer he completed a residency at K11 Art Foundation in Wuhan, China.